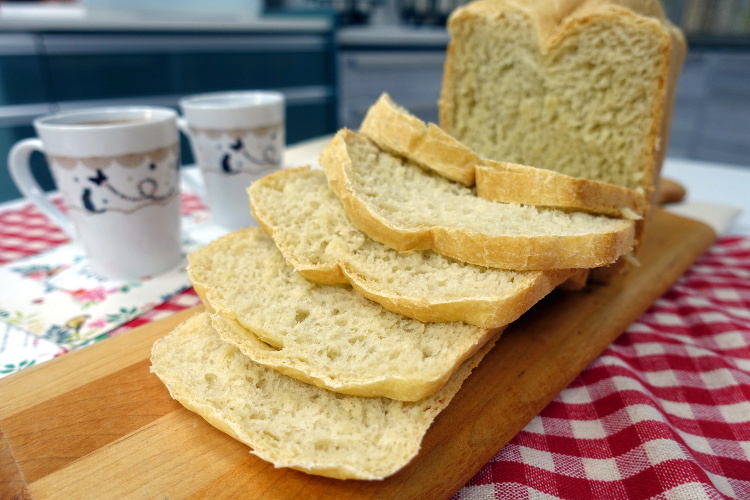 Use new SONG-CHO BREAD MAKER, SCBK06A to make this plain bread (recipe based on manual). Water >> Butter >> Salt >> Sugar >> Bread Flour >> Yeast (yeast to be poured on top of the dry flour and must not come into contact with salt). Press (and hold for 2 sec) START/STOP button (need not press MENU as Basic bread is no. 1 on the menu). It takes 3 hours to complete the entire process. Open the lid when it is done. Using mittens, bring the barrel holder up (careful, it’s hot!). Hold the holder using a cloth or mitten, remove the barrel by twisting it at an anti-clockwise direction. While the bread is still hot, remove it from the barrel by holding the barrel upside down using a cloth or mitten and shaking it (do not use sharp object to try to get it out). If the bread sits inside the barrel for too long, it may wrinkle and affects the texture. You may choose to brush it with butter to have a nice outer sheer. Slice the bread once it has cooled down and enjoy the fresh bake. Note: if the mixing blade is stuck into the bread, remove it before cutting the bread. 程序完成后, 打开盖子. 利用护手套或厚布将面包桶的手柄拉上 (小心烫), 再利用抹布将面包桶逆时钟取出. 在面包还热时从桶内取出 (用摇晃方式, 不要用利器或其他物件将它挖出). 如果把面包置放在面包机内太久, 面包很容易呈现皱纹, 影响口感. 如喜欢, 可在面包表层涂抹牛油, 即好看又美味. 待面包冷却后切片享用 .